Virendar Sehwag created history today at Holkar Cricket Stadium, Indore as he surpassed the record recently made by Sachin Tendulkar of 200* against South Africa, making 219 off 149 balls against West Indies. 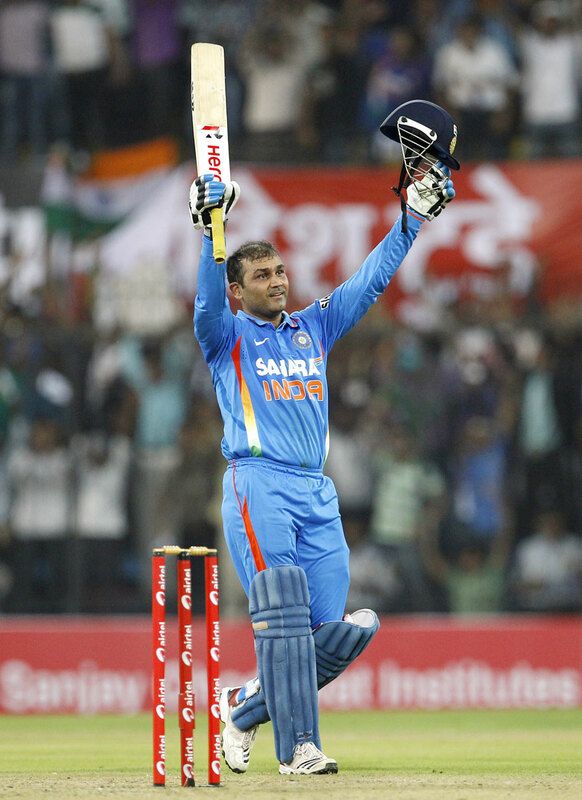 Sehwag achieved his double hundred in 140 balls to get his double century , hence breaking Tendulkar's record by scoring 219. His innings included 142 runs in boundaries which included seven sixes and 25 fours. "The wicket is good to bat on, the outfield is fantastic and the boundaries are 50 yards. If we just show some patience and look to bat 30 overs, we can score some runs. But I was not expecting 200." His record-breaking was a display of exuberant performance which concluded in an excellent manner, as Sehwag and Gambhir gave India the kind of start they had failed to produce up to this point in the series. "I'm very tired because I'm 33-years-old. I'm an old man and my back and glutes are tight. I'll go and take an ice bath and get back on the field."